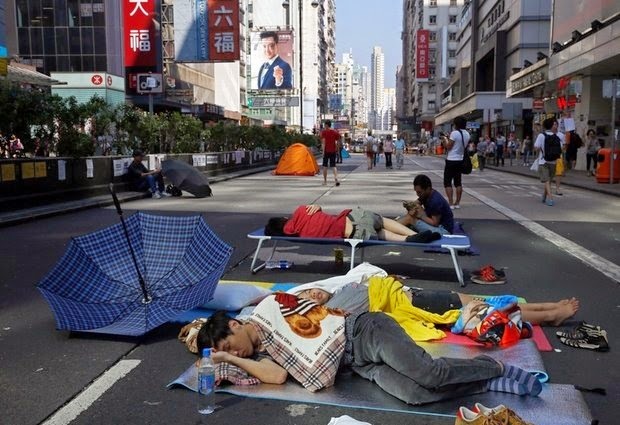 Pro-democracy protesters sleep in a main road in the occupied areas in Hong Kong's Mong Kok district Saturday, Oct. 11, 2014. Thousands of people are pouring into a main road in Hong Kong last night to show support for a pro-democracy protest after the government called off talks with student leaders. HONG KONG (AP) — Students leading pro-democracy protests in Hong Kong issued an open letter Saturday to Chinese President Xi Jinping, urging him to consider political reforms in the city and blaming the city's unpopular leader for the demonstrations. The letter, issued by two student groups leading the protests, said Hong Kong Chief Executive Leung Chun-ying was responsible for a civil disobedience campaign that has seen tens of thousands of people throng the semiautonomous city's key thoroughfares over the past two weeks. Thousands of demonstrators showed up in the main protest zone on Saturday, two days after Hong Kong's government called off scheduled negotiations with students who are demanding voters have a greater say in choosing the city's leader in 2017 elections. The protesters have vowed to keep up the demonstrations until the government responds to their demands. "Students walked out of classes and are occupying different places now because Leung and others have repeatedly ignored what the people want," the letter read. "If the central government is confident, it should not be afraid to let Hong Kong people elect their own chief executive." Chinese Premier Li Keqiang said Friday that he was confident Hong Kong's government can preserve "social stability." He did not directly mention the protests, but stressed that Beijing won't change its "one country, two systems" approach to running Hong Kong. Meanwhile, a Chinese state-run newspaper blamed the United States for being behind the protests — a claim the U.S. State Department strongly rejected. In a commentary published on the front page of the Communist Party-run People's Daily's overseas edition Friday, the newspaper said the National Endowment for Democracy, a Washington, D.C.-based nonprofit group, became involved in the Hong Kong protests as part of a U.S. strategy to undermine foreign governments in the name of promoting democracy. Citing unidentified media reports, the commentary claimed that Louisa Greve, a director at NED, met with Hong Kong protest leaders months ago to discuss the movement. The group did not immediately reply to an email requesting comment Saturday. According to its website, the organization is devoted to "the growth and strengthening of democratic institutions around the world," and is funded largely by the U.S. Congress. When asked about the U.S. State Department's role in the protests, department spokeswoman Marie Harf said Friday that U.S. officials "categorically reject accusations that we are manipulating the activities of any person, group or political party in Hong Kong." "What is happening there is about the people of Hong Kong, and any assertion otherwise is an attempt to distract from the issue at hand, which is the people expressing their desire for universal suffrage in an election that provides a meaningful choice of candidates representative of their own voters' will," Harf said.